This past weekend was definitely a reversion back to college all-nighters at our house. (And not the good kind, the working-all-night-last-minute-on-a-paper-kind)... We had an event for charity at our house to get ready for & of course the kids (and us!) got sick and wanted our attention 100% of the time. We literally had to attempt to get every hair into place at the house - in every room- before the event and sleep just could not happen. My voice still hasn't fully returned. Anyway, along with getting the house ready, we decorated it for Christmas. This year I was given two big beautiful poinsettia plants so I used them around the house in arrangements everywhere. In the living room, kitchen, bedrooms and bathrooms. I was amazed by how far the two plants stretched. They did the whole house! I think I remember seeing this idea in last year's Better Homes & Gardens December issue and loving it. It was an awesome way to get a massive amoutn of holiday flowers and arrangements without spending a ton. In our house, we went with white poinsettias because red doesn't work very well in here. It's really interesting that poinsettias' petals are actually leaves that have changed colors and not petals. According to the Mexican legend, poinsettias were just a humble weed until one night when a poor little girl named Pepita had nothing to give to the baby Jesus in the Nativity scene at her Church. She decided to pick a bouquet of the weeds but was still embarrassed and upset she had nothing to give but weeds. When she presented her gift to the baby Jesys her lowly "weeds" bloomed into beautiful big red flowers right in front of everyone,according to the legend, and it became known as a "Christmas miracle." According to Vonda J. Sine's article on poinsettias, "This beautiful Mexican plant is such a symbol of Christmas that an act of the U.S. Congress named December 12 Poinsettia Day, Holiday Insights reports. This special day honors Joel Roberts Poinsett, who as the first ambassador to Mexico introduced the poinsettia to the United States. He raised the plants on his Greenville, South Carolina plantation and gave them to friends as gifts." ...Anyway, the weekend went off without a hitch- thanks to some amazing friends & neighbors﻿- and we're here to tell the tale. Also, if you've emailed a question to me recently and haven't heard back, please shoot me another email. I'm having a really difficult time right now balancing family work and the blog, and blog-related queries often have to take a backseat because there simply aren't enough hours in the day. Also, in the back of the Better Homes & Gardens Magazine you can find sources for everything in my home. I gave them the information myself so it's correct but I know some of the items like the caged lanterns often go on backorder/ aren't always available. Thanks so much for understanding!! This is such a great idea and a lovely way to display the poinsettias! I think I will separate mine into small clusters thanks to your post! great historical reference to poinsettias. i can't wait to get some and tell the tale. Hope you & your family feel better soon. I'm wondering about your camera, or lens, or maybe you're just a great photographer? All of your pictures have such a beautiful glow to them and a very professional look. Do you have a great camera, or any tips? I've never been a big fan of poinsettas (call me crazy!) but I LOVE what you did with all the petals--I'm inspired to try that in my home.... Thanks for the beautiful idea! I love your home and your style overall. Can you tell us how you created your "fireplace"? Have you done any research about vent-free fireplaces so that you could actually have a nice fire on that living room? I want to do something similar and would like to hear opinions. Thank you and best wishes for 2011! White poinsettias are a favorite of mine and look so beautiful in your home. And that's so interesting about the leaves changing color, I never realized that. Love your paisley stencil! We did our laundry room in a paisley stencil and I love it so. this is so pretty, Lauren! I love how you put the silver balls in the fern...very fun! Hi Lauren, you're not alone -- its IMPOSSIBLE to keep p with job, family and blogging. And, when someting has to give, good for you for letting the blog go a bit. The poinsettia idea -- in all these years I've never thought of that -- duh! I love it. what a way to spread the beauty and the budget! Great idea, as usual! I'm a big fan of the pink-ish candy cane poinsettias. On our high mantle display this year, I put some real ones next to some fake ones - even my mother (notorious fake flower-hater) was fooled. Love the with poinsettias and thanks for mentioning Greenville, SC. I've lived here my whole life and most people don't know about the poinsettia story! Mr.Asparagus fern with his few Christmas balls is my favorite Christmas decor so far!! Wish he would come and live in my house!! Everything you have shown looks beautiful. I would love to put the poinsettias all over the house! Maybe next year I will try it, this year my poinsettia has to stay together. My husband (also named David) came home from the store last week with a gorgeous poinsettia for me. He knew I really wanted one but would not buy one myself so he picked out one and brought it home to me. I cried! Happy tears! Everything is so pretty and I'll just have to enjoy your poinsettias since I have cats and a dog who might nibble and they're poisonous to animals. I love what you did with your flowers to make them go farther. How Beautiful! I love your simple elegant style! Fern green and white flowers are so refreshing during the holidays. I'm wintering at our old farmhouse in western North Carolina and already wishing it was April. Does that make me a Scrooge? The pictures of your home in Better Homes and Gardens are gorgeous. Happy Holidays to you and your lovely family! I am your newest follower. You have a lovely blog. I would love for you to stop by my blog Heirloom Philosophy sometime soon and say hello! I've been reading your blog for a while now but not commented before now. I lived in Mexico for a while, years ago, and in the interior of the country, up in the mountains, the Poinsettas grow tall, not like trees but tall shrubs, maybe six feet. Really beautiful! 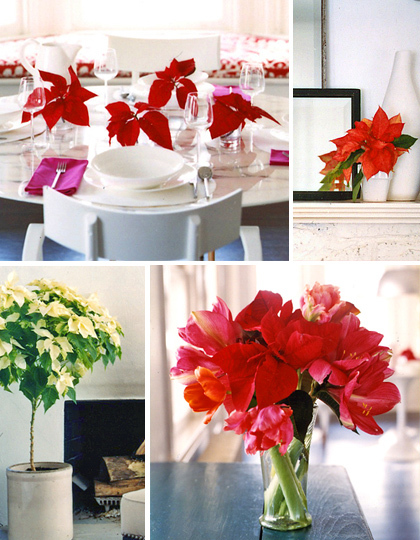 Love the poinsettia flowers being used in vases so much more than a potted poinsettia...thanks for sharing! !